Located at 711 Bourbon Street, the site of the historic Tricou House. Bourbon Heat opened in January 2011after a complete restoration of the outside and renovation of the interior. 711 Bourbon has one of the highest historic ratings and has the last traditional carriageway on Bourbon Street. The Tricou House has a long history in New Orleans and a ghost to boot. That’s right, as the legend goes the ghost of Dr. Tricou’s niece Penelope, who tumbled down the stairs to her death, haunts 711 Bourbon. Today the ghost of Penelope has lots of visitors, as Bourbon Heat has become a favorite of locals and visitors alike. In fact, several Television Shows have filmed here. Bourbon Heat has garnered the reputation as the cleanest and safest venue on Bourbon Street. The lush courtyard, extensive offerings of local cuisine and electric club upstairs set Bourbon Heat above other venues on Bourbon Street. Happy Hour and Ladies Night prices are the best deals on Bourbon Street. 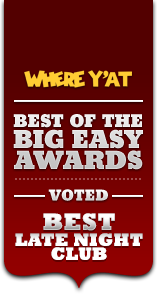 In 2012 Bourbon Heat was named ‘Best New Club and Best Happy Hour’ by the readers of Where Yat Magazine. For the more quintessential New Orleans experience, stroll off Bourbon Street through our historic carriage way to our lush inviting courtyard. Enjoy the sounds of the music that made New Orleans famous sitting at a wrought-iron table sipping the best new cocktail to hit Bourbon Street in a generation. The Heat, Bourbon Heat’s signature cocktail made with a blend of Malibu Red Rum and fruit juices has become a favorite of all who visit Bourbon Heat. If what you prefer is the traditional feel of a French Quarter local’s hangout, the Courtyard bar is the place for you. It’s rustic brick and stucco walls, ornate carved wooden back bar and flagstone floor and wooden bar stools can’t be mistaken for anything but a French Quarter low key bar where you can spend hours talking to the bartender. The opposite of the low key Courtyard Bar is the upstairs dance club. The club features, a high-tech light and laser show, VIP Bottle Service and the best DJs and Video DJs in the City. When the action gets too hot visitors can step outside to the 50ft balcony overlooking Bourbon Street. 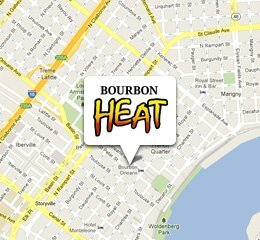 Bourbon Heat is available for private functions from small social or corporate events to complete buyouts.